On 13th March, we showed the love in a big way—by celebrating how people around the country are helping to protect the lives they love from climate change. 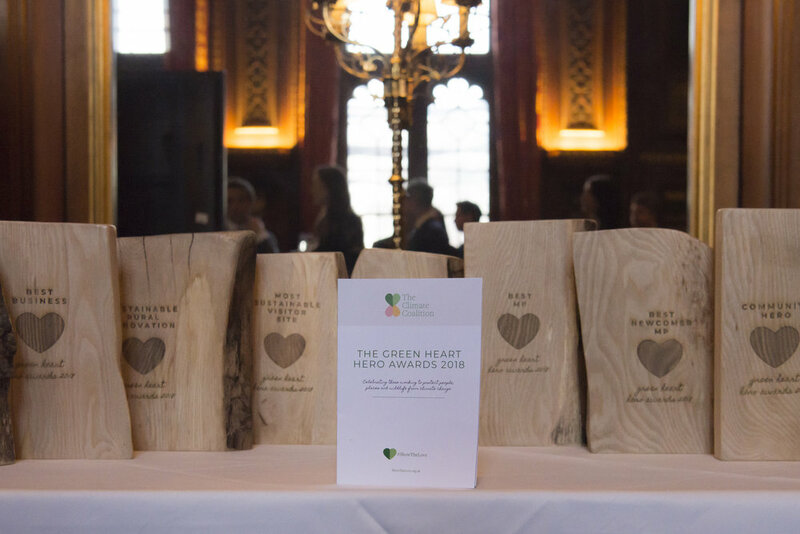 Culminating months of exciting activity, the Green Heart Hero Awards are our chance to give a big round of applause to the movers, shakers, and doers who are paving the way to a cleaner future. Our inaugural ceremony featured an incredible audience, including over 40 MPs from across all major political parties, Prime Minister Theresa May, Climate Minister Claire Perry, sport and business leaders, well known TV personalities, and inspirational community members. The incredible nominees and winners show that beautiful things truly are possible when we work together to tackle climate change. NIGG BAY, MORAY FIRTH — WINNER! The Moray Firth RSPB reserves are internationally important for wintering waterbirds, as the birds stay in the marshes when visiting from their breeding grounds in the frozen North. Climate change, however, is threatening the area. Rising sea levels risk decreasing the areas of mudflat for feeding and saltmarshes for roosting, and increased storminess will further erode these fragile habitats. The RSPB have taken steps to provide a new coastal habitat for these birds. In 2003 they breached part of a sea wall at the nature reserve at Nigg Bay, allowing the sea to flood the field behind. Years later, there are multiple species of saltmarsh plants and thousands of birds can be seen at any one time. Based on the site of a former golf course, The Kingsway Local Nature Reserve is currently being created by North Lincolnshire Council. Construction of the reserve is well underway and once completed, it will measure 12 hectares. It is hoped that with this habitat recreation, nightingales and woodpeckers will return to the area. Local people will be actively involved in the site’s running and the reserve will provide an important learning environment for local schools. 90% of residents who were consulted were in favour of its creation and 1/3rd wanted to volunteer. Benches and some surfaced footpaths will ensure accessibility for those less-able, meaning all residents will be able to enjoy this little piece of nature in the heart of Scunthorpe. Where the rivers Trent and Ouse join to form the Humber sits the Alkborough Flats, managed by Natural England. The river defences were purposely breached to form a large flood plain to protect the lower reaches of the Humber from flooding. Not only does this protect thousands of homes, but it has created new habitats for wildlife. The area has become a haven for wading birds, wildfowl, otters, brown hare and several species of bat. A number of events are held at the Flats throughout the year, including group walks, bat detecting and photography sessions. Marylebone Cricket Club has pioneered environmental sustainability in professional sport at its home, Lord’s Cricket Ground. 100% of the ground’s energy needs are sourced from wind power, and solar thermal and photovoltaic panels have been incorporated into the roof of the new Warner Stand to generate hot water and electricity. Lord’s also boasts the most comprehensive recycling system of any national sporting venue, delivering zero waste to landfill. The club reaches out to the local community through their sustainable initiatives. For example, unused edible food - always organic and as locally sourced as possible - is delivered to those in need in the surrounding area via local charities, with food waste segregated and dispatched for anaerobic digestion. Manchester City FC’s ‘City Football Academy’ (CFA) opened in 2014, combining an elite training centre with a real commitment to sustainability. It sits at the heart of the community and exerts minimal environmental impact. 80-100% of the academy’s water is gathered onsite through harvesting and storage, whilst a dedication to recycling and reusing means that zero waste goes to landfill. By using the latest technology, each hectare of the academy’s turfgrass absorbs 6.5-8.5 tonnes of C02, and through the creation of extensive wildflower meadows and wetlands, what was once toxic, post-industrial land is now home to wildlife and 2,000 trees are providing cover for birds. FOREST GREEN ROVERS — WINNER! Forest Green Rovers are aiming to become a zero carbon club at the earliest opportunity, and are making impressive progress towards their target. The club’s onsite solar panels generate around 11.5% of electricity used at the players hotel and the stadium, and even the club lawn mower, the ‘mow-bot’, gets its power from both solar and wind. The club is equally serious about waste management, and in 2016-17, 100% of waste produce was diverted from landfill. The club also aims to protect and enhance habitats around the ground for wildlife and flora, conducting bat and floral surveys. Eager to promote environmental practices among fans, the club is creating an eco-education centre and has banned the sale of all meat products at matches. ST MARY'S CATHOLIC PRIMARY SCHOOL, MAIDENHEAD — WINNER! St. Mary’s Catholic Primary School in Maidenhead has a longstanding commitment to environmental issues. Since 2008, it has been awarded five Green Flags—the internationally recognised award for schools, commending excellence in environmental action. This marks a decade of environmental action that has seen the school reduce their gas bill by 40%, reduce waste by a third, and build a greenhouse from 2,000 plastic bottles. The school also has its own eco-garden where they grow fruits and vegetable and, in collaboration with The National Trust and local environmental group ‘Make Space for Life’, owns their own forest school site. Local Reading organisation ‘Nature Nurture’ delivers workshops and training, with a focus on nature, sustainable living and the creative arts. The organisation aims to engage young people with the nature on their doorstep, underpinned by the belief that spending time outdoors is vital in cultivating respect for the planet and general wellbeing. Working with local schools, authorities and organisations, the organisation offers a range of initiatives, including Family Wild Days, which involve activities such as den making, bug hunts and pond dipping; Forest School workshops; and resource creation. The project Wild Town Mission is the organisation’s current focus, which aims to connect communities, especially children, with underutilised green spaces. St Colm’s eco-ordinator, Clare Devlin, has helped the school become a bastion of sustainability in Draperstown. From litter blitzes, to bird-feed making workshops, to seasonal planting, the school is a hive of activity. The school have created a biodiversity trail, complete with information signs and an orchard. Within the biodiversity trail, pupils were invited to plant trees in memory of loved ones. Almost 200 native trees were planted in this remembrance area. The school is very involved with the community; volunteers from the local Men’s Shed initiative work with pupils on projects and surrounding primary schools come together at St. Colm’s for events such as WWF’s Wear It Wild day. RUBIES IN THE RUBBLE — WINNER! A third of fresh produce never reaches our plates, but Rubies in the Rubble are determined to change this. Working with UK farmers, the company uses surplus fruit and veg that would otherwise be discarded and turns them into delicious relishes and ketchups. Their products are stocked in Waitrose and Harrods, and used in chains such as Eat and Marriott Hotels. In partnership with Virgin trains, for example, the company collects around 1,300 apples each week that would otherwise be thrown away, and turns them into chutneys that are sold back to Virgin. This benefits both customers and the planet, and in 2017 they saved a record amount of surplus produce - an incredible 198 tonnes! As one of the leading providers of investment to local energy projects in the UK, Leapfrog Finance serves communities seeking to benefit from low carbon technologies. Leapfrog’s Bridge Fund provides affordable finance to projects by funding construction, project acquisition, and underwriting share offers. Since the fund’s inception two years ago, Leapfrog has funded 23.1 MW of community-owned projects, utilising £28.8m of bridging finance. One project they have helped is a community group in Plymouth, which has installed a 4.1MW solar array on a derelict brownfield site. The site will produce enough clean energy to meet the annual needs of 1,000 homes and generate around £3 million in income for the community group, which will be used to continue combating energy poverty in the area. Sustainability is at the core of Commercial Group, the UK’s largest independent business services company. Both the London and Cheltenham offices have solar panels, and the company boasts the UK’s largest privately-owned fleet of hydrogen-enabled vans. Their London operation also devised an award-winning ‘closed-loop’ initiative for collecting clients’ recycling, enabling recycling services to be provided to 300 London businesses for free. Their Green Angels programme supports staff-led initiatives for environmental and social projects, aiming to inspire employees to take responsibility for sustainability. Over 140 staff have been involved in managing projects, which have ranged from creation of a living wall, to a solar powered bike shed, to achieving zero-waste company status. Ashley Cooper is a photojournalist who spent 13 years travelling to more than 30 countries to document the impact of climate change. His collection ‘Images from a Warming Planet’ illustrates the devastating effects climate change is having, emphasising the disproportionate impact on poor communities. He plans to send a copy of the book to every world leader, and has already received acknowledgment and support from the Pope. Following on from the book, Cooper is planning to set up a website, I Commit, which aims to get people from all around the world to upload their own images of climate impacts. COMMUNITY-BASED GREEN ENERGY PROJECT IN KENYA, CAFOD — WINNER! Between 2011 and 2015, a CAFOD-backed project has provided sustainable energy to nearly half a million Kenyans in the energy-poor rural areas of Kitui, Isiolo and Kajiado. 90 schools have been installed with solar lighting and 29 schools were provided with solar water purification systems, enabling pupils to access safe drinking water. The project has also resulted in improved drug storage for just under 50 health institutions as a result of solar powered refrigeration systems. Community members have been involved in all aspects of project design and many have received training on how to operate and maintain the systems. This three-year programme has helped people in remote areas of Bangladesh- one of the countries most vulnerable to climate change globally- prepare for potential disasters and adapt to environmental change. This included excavating canals for improved irrigation, constructing roads for better access, and training local representatives to respond effectively to disasters in their communities. The implementation of early warning systems hasve benefitted around 170,000 people. The warning systems have been so successful that they have been adapted across the country. The programme also helped vulnerable households receive training in climate-adaptive ways to make a living, which has resulted in average family income to almost triple. JF Temple and Sons farm spans approximately 230 hectares of land around Wighton. The farm uses methane from a specially installed biogas plant, fuelled by farm waste, to generate up to 170kW of electricity. As well as being exported to the grid, the electricity produced is used for drying the grain, cheesemaking, heating hot water for dairy, and heating the farmhouse and three neighbouring cottages. To reduce energy usage and improve soil conservation, the farm has recently equipped four staff houses with solar panels and a biomass boiler, and uses strip tillage for maize. They frequently show groups of visitors around the farm to educate people about climate change and sustainable farming. In Bethesda, North Wales, the not-for-profit Energy Local Club has been formed between over 100 households and a National Trust-owned hydroelectric generator. Using smart meters and an online ‘Energy Dashboard’, households can match their electricity use to when the hydro is generating and pay an agreed price for power. Since January 2017, over 50% of participants’ electricity use was generated from hydro and 80% of households reported a drop in their electricity bills, allowing more money to be spent within the community. The scheme has been so successful that they plan to double the number of households involved from March 2018. Based in the heart of rural Sussex, Hepworth Brewery is shining the sustainability light in the world of real ale. A home-made beer heat pump has given an immediate 10-20% reduction in fuel bills and their innovation is so successful that Brighton University is looking to patent the invention. All of the brewery’s lights are low energy LEDs, and they are so proud of their solar panels that they have named a new beer ‘Solar’ in their honour. Bike racks for staff and visitors have been installed, the shop stocks local produce, and the brewery sources as many ingredients as possible from Sussex. Ed Davey was drawn to politics by his passion for the environment, and 20 years later the MP for Kingston and Surbiton remains as committed as ever. During his time as Secretary of State for Energy and Climate Change between 2012 and 2015, he worked hard to ensure that sustainability was moved up the political agenda. His work helped achieve a massive increase in renewable electricity in the UK; and helped secure an EU-wide agreement for new climate change targets and implemented Britain’s first ever community energy strategy. As chair of the Environmental Audit Committee (EAC), Mary Creagh has pushed for improved government environmental policy. Recent major breakthroughs under her tenure include the EAC recommended ban on microbeads, and the ‘latte levy’ for plastic-lined coffee cups, currently being considered by the Government. She is also determined to make sure the environment is an important part of Brexit negotiations and that the UK’s strong environmental standards are upheld, calling on the Government to introduce a new Environmental Protection Act during Article 50 negotiations. Mary has served as MP for Wakefield since 2005 and spent three years as shadow environment secretary from 2010-2013. Bernard Jenkin’s action on environmental issues has been primarily oriented around his constituency of Harwich and North Essex. He has campaigned for an extension to a nearby area of outstanding natural beauty; advocated for Marine Conservation Zones at the Stour and Blackwater Estuaries and is supportive of the Essex Wildlife Trust and their efforts to preserve wildlife native to the area. He has consistently engaged with his local WI group on climate change, and following the latest meeting, introduced members to his local policy forum so that they could work together to suggest policies to Government. CAROLINE LUCAS, MP FOR BRIGHTON — WINNER! Caroline Lucas served for eleven years as one of the Green Party’s first MEPs before being elected as the first Green member of parliament in 2010. Caroline sits on the parliament’s influential Environmental Audit Committee and is the co-chair of the All-Party Parliamentary Group on Fuel Poverty and Energy Efficiency. She is a dedicated environmental campaigner, and has written a number of books on climate change and politics. She is Matron of the Women’s Environmental Network and is a passionate voice for environmental causes at Westminster. REBECCA POW, MP FOR TAUNTON DEANE — WINNER! Following a career as an environmental correspondent, Rebecca Pow was elected as MP of Taunton Deane in 2015. Her passion for improving, not just protecting, the environment is clear: she held the first debate on soil in Parliament and was a key figure in the campaign to ban microbeads in personal care products. In collaboration with the Conservative Environment Network, she convened 10 MPs to contribute to a report encouraging a holistic approach to environmental policy, highlighting the need for cross disciplinary commitment to the issue. She is passionate about the environment in her constituency, and has improved the cycling and walking networks across Taunton Deane. Alex Sobel has campaigned on sustainability since university, and discussed climate change in his maiden speech. Since his election in 2017, he has become an officer for the All-Party Parliamentary Climate Change Group and sits on the Environmental Audit Committee. He is an executive committee member for SERA, Labour’s Environment Campaign, and is open about his desire to use his position as an MP to deliver the message that climate change will affect everyone. MP for the Wells Constituency since 2015, James Heappey is a keen advocate of clean growth. He has served on the Energy and Climate Change select committee, written on the importance of rewarding energy efficiency and champions the opportunities that clean tech brings. In his constituency, he has been involved in the plastic free coastline scheme and pledged to support Glastonbury Friends of Earth’s campaign to ban neonic pesticides. Launched last autumn, ‘repair, remake, reuse and refresh’ is the ethos of the Horsham Repair Cafe. Each month, expert volunteers provide a free repair service for broken and worn out items—from toasters to clothes to laptops. Visitors are taught how to repair or upcycle their items, thus gaining skills and saving money. There are specialist craft sessions, often given by other local community groups; Men in Sheds, for example, gave a workshop on wood. Groundwork South, a charity who offer energy saving expertise, also visit the cafe, giving attendees advice on switching suppliers and reducing waste. There is also a refill station for laundry and cleaning products, which helps visitors save money and reduce the number of plastic bottles used. Gower Regeneration is Wales' first community-owned solar farm. Situated on an old coal mine in rural Swansea, the 1MW farm provides clean energy for the demands of 300 houses, saving an estimated 11,500 tonnes of CO2. More than 400 people signed up to the community share offer - raising £775,000 - and the annual return to investors is projected at 5%. On top of providing clean and renewable energy, Gower Regeneration has been keen to ensure that the solar farm delivers lasting social benefits and aligns with broader sustainability goals. Profits—estimated at more than £500,000 through the 30-year life of the project—will be reinvested in other eco-projects, as well as in education about sustainable development. ROSE HILL AND IFFLEY LOW CARBON — WINNER! Rose Hill and Iffley Low Carbon (RHILC) covers Oxford’s Rose Hill council estate and Iffley. Since its creation in 2013, RHILC has been hugely successful in working towards its vision of making Rose Hill the first zero-carbon council estate. They encouraged the council to install 190 solar panels on the community centre, generating 57,000kWh of electricity a year and the car-share club now has an electric car powered by solar. They also run bike and electric goods repair workshops, swap shops, and organised a thermal imaging campaign to advise residents on minimising heat loss. Recently, they have worked to install PV panels and battery storage systems in social housing. A firefighter for 22 years, Simon Jakeman has seen firsthand the increased frequency of extreme weather events due to climate change. It is this proximity that inspired him to act. Under his guidance, his fire station in Surbiton, became London’s Greenest Fire Station and in 2015 he became London Fire Brigade’s Super-Green champion, giving presentations to front line staff on making their workplace more eco-friendly. He is now at the forefront of promoting environmental work across all UK Fire Brigades as a full time Green Champion Coordinator. Through his efforts he has made sustainability a priority for fire brigades across the country—from making stations more energy efficient, to creating gardens that provide seasonal produce for crews. Mersea Harbour is under threat from erosion by storm wave action, with the harbour at risk of disappearing within 20-30 years. But the Mersea Harbour Protection Trust—a community group lead by Mark Dixon—aims to stop this by delivering a climate change adaptation project. 1.7 million tonnes of material from a local dredging programme will be used to recharge the salt marshes to protect the harbour and slow the rate of erosion. Under Mark’s guidance the group hopes to raise the money for the project, and protect the harbour for at least 100 years. By doing so, it will provide habitat for wildlife and ensure that the commercial interests dependent on the harbour will continue to be viable. Bury St Edmunds local, Karen Cannard, is the creator of The Rubbish Diet, an easy to follow challenge that inspires households to dramatically reduce their waste within a few weeks. Over three weeks—the initial dieting challenge—the Rubbish Diet sends weekly emails with ideas and tips and suggests ways for streets or friends to take part together and stay motivated. Karen began blogging about waste in 2008 when she took part in Zero Waste Week and she hasn’t looked back since; The Rubbish Diet, which formed as a result, has since become a national campaign. Since its conception, participants have saved over 1,786 tonnes of waste from landfill and £349,000—so it’s good for the environment and for the dieters! Karen is also a trustee of ReusefulUK and Sustainable Bury.